Kivengere was a man of his age. Neither he nor the churches around him were perfect, but they had experienced God in an unusual way. Our day may demand more accurate theological thinking than his, although we cannot deny that Festo did indeed read deeply, extensively and constantly in very solid theological material. Yet for all that, Festo Kivengere has a great deal to teach us about personal love for Christ, unflagging belief in the power of the cross to save people and great endurance to the end. "We read of the breathtaking courage of Festo who, face to face with Idi Amin, pleaded for the lives of innocent souls when that ruthless dictator went on the rampage. This was a saga of grim brutality. It is amazing that Festo survived... Festos own conversion is well told and illustrates the power of revival... This book has the added value of providing a much needed balanced overall perspective and understanding of twentieth-century evangelical Christianity in the heart of the African Continent. Erroll Hulse, editor Reformation Today. Festo Kivengere by Frank Retief was published by Evangelical Press in December 2012 and is our 42863rd best seller. The ISBN for Festo Kivengere is 9780852348512. Bishop Festo Kivengere was one of the greatest African Christian leaders of the 20th century. Here is a story of the man who loved Christ and loved to preach the cross. Born in 1919, he lived through and was part of the revivals that swept Uganda in the 1940s, 1950s and 1960s. Eventually he became an Anglican bishop and an internationally known preacher. 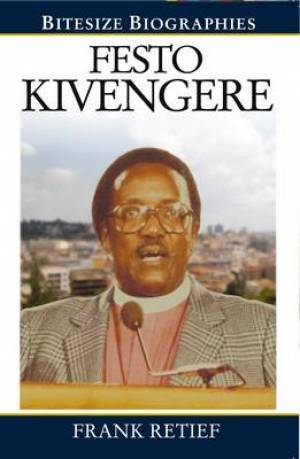 This biography summarises the key points in Bishop Kivengere's life with many quotes from his official biography and those who were close to him. The author takes time to stand back and review his actions and is not afraid to criticise. We learn about the dangers of excess in revival. We see a man struggling to maintain balance between family life, work life and evangelism. We see a man who believed in the Keswick higher life teaching and we see the effect this has on his ministry and the church. Bishop Kivengere also lived through the turbulent political times that Uganda experienced not the least being the wicked rule of Idi Amin. His experience helps us to understand the pressures and difficult decisions that Christian leaders have to take in such situations. Those who have a love for the continent of Africa will find this book especially interesting. Got a question? No problem! Just click here to ask us about Festo Kivengere.